This page explains my opinion on nutrition, as well as my long-term approach to diet. Your diet is everything you eat. Good, bad…it really doesn’t matter. What you’re putting into your body is a part of your lifestyle. Do you really want to deprive yourself of foods you love for the rest of your life? I sincerely hope not! That’s not the way to “diet” for the long term. For the most part, your diet should include all the foods you love, in moderation. Cheeseburger, french fries, soft drinks, chocolate. If you eat this way all day, every day, you are going to look and feel like poop. I do not believe there is any benefit to having soda in your diet, so I always skip that one. But, if I want a cheeseburger and fries, I’m going to have that burger and fries. Most often, I’ll have a homemade burger from organic, grass-fed ground beef with organic sliced cheddar cheese on a whole-grain roll with lettuce and onion slices. However sometimes, it’s a beacon cheeseburger from the fast food joint down the street. But, it’s always in moderation. Nutritionally speaking, the goal for this site is to provide information you can use for a lifetime – not just some quick fix to help you lose weight fast. I want to give you a way to cook meals for you and your family that will keep you healthy for life, and a diet that will help you lose weight, tone up, and keep you looking fit – but all while tasting good. The best diet tool is your brain, so make sure to think before you eat anything. Ask yourself why you’re eating it. Are you really hungry? What nutritional value does it provide you with? 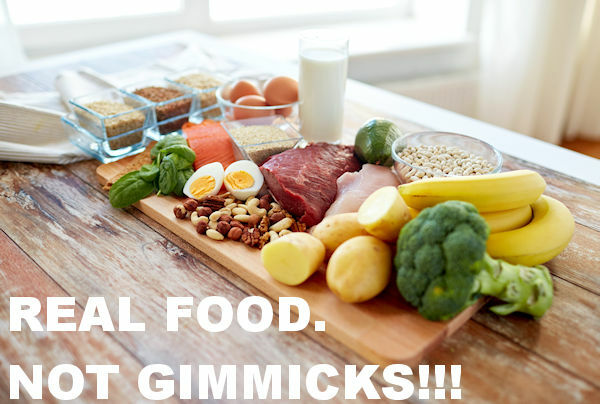 There are so many diets out there that it can become very confusing. Off the top of my head, here are a few that come to mind: Atkins, Weight Watchers, Portion Control, Primal, Paleo, Traditional Japanese Village, Mediterranean, Cabbage Soup Diet, Watermelon, and Lemon Water Diet. Now, I’m not saying the above diets will not help you lose weight. In fact, some are actually very good ways to eat – but some are very unhealthy. The recipes and nutritional information on this site borrows from some of these healthier diets. Cutting carbs, going low-fat, or eating a high protein diet can all be useful for short-term weight loss. For the long-term, I believe a diet needs proteins, healthy fats, and whole grain carbohydrates to provide nutritional value to you and keep your body functioning optimally. I base my own diet around whole foods. Foods that grow in the ground, live in the sea, or roam the open plains. I hope you get the idea. Processed foods laden with ingredients you can’t pronounce, are sugar filled and stripped of their nutrients are not going to give your body the nutrients it needs to run at top performance, which is why I steer clear of them as much as possible and you should to. But realistically, a treat is not going to kill you as long as you live by moderation. This site is for informational purposes only. I’m here to share what I have learned over the years, what has worked for me, and what I know has worked for others. However, I want you to make your own decisions. Read and learn everything you can about nutrition and start implementing what you learn in your life, what works for you, what doesn’t work for you, and start making a difference today.